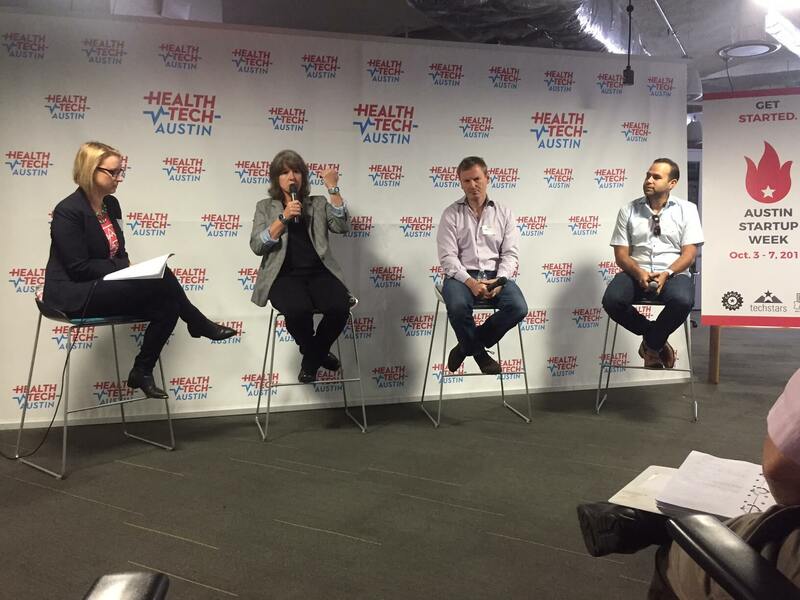 Another successful panel put on by Health Tech Austin yielded discussion on everything from regulation to funding when it comes to taking your product and innovation to market. Three entrepreneurs and current CEOs participated – Jean Anne Booth of UnaliWear, Chris Loughlin of RxWiki and Zac Jiwa of MI7. All three panelists noted past experiences with the healthcare industry as influences in their path to disrupt the industry. Loughlin advised listeners to jump right in, discuss their product with their target market and be willing to put in the work. Booth agreed that tenacity was necessary, while Jiwa credited great mentors as an influence in his early success. Certainly an interesting, but entertaining way to describe the “fast follower strategy” outlined by Booth. Panelists said that if someone else has paid to create a market, it is smart to follow up with your more efficient product. According to Jiwa, “If you have to educate your market you might be dead.” Taking advantage of an established market is key. Booth wished that she had been aware of the reality of how much time it takes to raise capital. Having both knowledge and realistic expectations about obtaining funding from angel investors and VCs is very important. Laughlin believes that releasing a simple product into the market to see if it gets any traction is the best way to avoid wasting time. It can help you pitch angel investors and VCs when you can point to past success. Jiwa also believes in keeping your product simple and bringing “laser focus” to your market as well. He advises that simplicity and tightening your market segmentation can help gain trust with customers. Then when it’s time to move on to something more complicated, they have faith in you. All three panelists were able to agree that regulations were a hassle. The FDA is expensive and HIPAA is complicated. Jiwa suggested hiring great lawyers who know the laws and regulations surrounding the industry extensively. The consensus was that education was key. Educating employees, investors and anyone else who is involved is extremely important. Funding was a major topic on everyone’s mind and the panelists each had different experiences to share. Jiwa firmly suggested listeners fund their company with client revenue if at all possible. Loughlin shared both positive and negative experiences with VCs, concluding that they need to be helpful beyond just the cash they contribute. Booth agreed that great VCs and angel investors can lead to great connections. She reiterated the importance of being intentional about how much money will be needed at each stage and how long it will take to raise it. Bootstrapping will most likely be required at some point. Additionally, if you do decide to take angel investors it is important to keep them updated. Booth provides a balance sheet, P&L and a one-page summary of what’s going on in the company including funding, people, strategic relationships, press, and what she needs from them each month. After much discussion regarding the validity of a minimum viable product (MVP), Jiwa jumped in with a final word of advice; don’t get trapped in pilot hell. This means waiting for your product to be deemed “viable” before a company will pay you for it, sometimes for years. Take something small that you know is viable and charge for it, even if it isn’t very much. This is a seed of growth for the next stage.